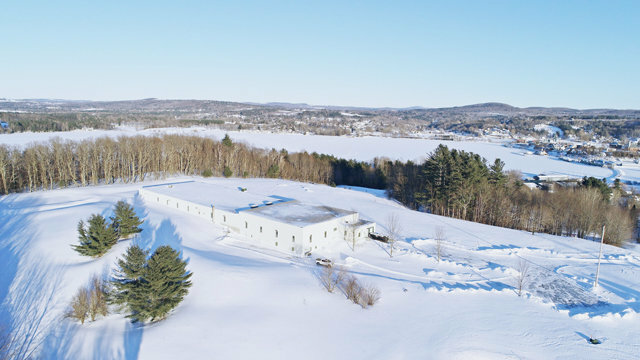 Commercial Sale - Newport City, VT This 46,000 sq foot building sits on 25 acres in Newport Vermont. This property has lots of potential for warehousing and / or manufacturing. The main level offers over 35,000 sq feet and the walkout lower level offers another 11,000 +/- sq feet. The building sits proudly on a hillside over Lake Memphremagog yet is not visible from Lake Road. The site received substantial permitting and infrastructure for over a 100,000 sq foot expansion which did not occur. Site work that was completed in preparation for this addition included enhanced fire protection, upgraded power, as well as increased storm water retention capacity. This is a great opportunity to start or grow a company. This building has great potential for processing & warehousing for the emerging Hemp Market. Furthermore the site is within a designated Foreign Trade Zone, as well as the Opportunity Zone (part of the Jobs Acts & Tax Cuts) and it could also qualify for New Market Tax Credits. The building is in need of an updated HVAC system and has been priced accordingly. The parcel is on the outskirts of Newport City and has good access to Interstate 91, only a few minutes from the Newport Airport and only 15 miles to the Canadian Border. Newport Welcomes you!